When parts of the pool start to become stained or discolored, it is most noticeable on the white areas. It might not take much for white plastic, such as intake and jet covers, light fixtures and ladder anchors to begin to discolor. While this can happen seemingly overnight, if you take steps immediately you can prevent the discoloration from becoming permanent. 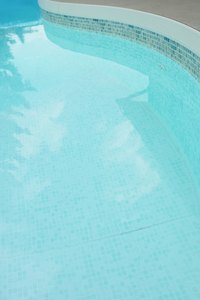 A number of minerals and organisms present in pool water can cause discoloring on white plastic. Algae can cling to the surface of the plastic as it multiplies. Discolorations that are greenish in hue are often algae, although less common forms of algae can also turn plastic pink, yellow or even black. Minerals that are present in excess can turn white plastic a variety of colors. A high iron content will often result in reddish-brown, rusty looking discolorations, while copper can result in plastic that turns blue, red or black. Some of the minerals common in well water, such as manganese, can turn plastic pink or red. When the chemical makeup in the pool is unbalanced in some way, discoloration can occur. Normally, chemicals such as chlorine and bromine keep the minerals and organisms that cause discoloration in check, but when they begin to multiply, one of the first places that will show signs of discoloration is white plastic. Algae can easily grow unchecked in an improperly balanced pool, and it can be introduced by something as simple as the rain or wind. Minerals such as manganese can be introduced in well water, while other minerals, such as iron and copper, can be picked up by water as it passes through old pipes before it is introduced to the pool. Copper can also build up as a result of the addition of certain types of chemicals, such as algaecides. Test the pool for mineral content as well as for chemical balance. Add chemicals as needed to bring the pool's levels up to the acceptable range for pH and sanitizers such as chlorine. Add oxidizers or sequestering agents to lower any mineral content that may be high enough to be causing staining on plastic fixtures. Once the proper balance returns to the pool, the discoloration should begin to disappear. To speed the process, scrub the plastic with a heavy bristled brush to help loosen whatever deposits are causing the stains. Test the pool every few days to ensure balance is maintained; pools sanitized with bromine will require more frequent testing because levels will fluctuate more rapidly than with chlorine. Shock the pool as needed, based on usage, to remove the buildup of spent chemicals. If the water tests high for mineral content, especially in older pools where worn pipes and fitting may be contributing to mineral deposits, consider installing a special filter that is designed specifically to remove these minerals. Regular scrubbing with bristled brushes will help keep white plastic clean and remove any buildup that can occur.